The report by Persistence Market Research focuses on the global pyrogen testing market for the forecast period 2017–2024. The main objective of the report is to provide key insights and information on the opportunities in the global market for pyrogen testing. The report starts with an executive summary that provides data on the market along with the segments and region-wise analysis. 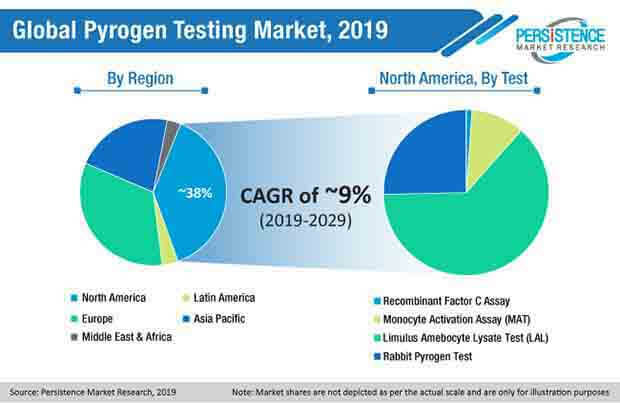 Details on the global pyrogen testing market consisting latest trends, market drivers, challenges and opportunities in the market are provided in the report. Factors driving the market and challenges based on a weighted average model have also been offered in the report on the global market on pyrogen testing. In order to provide meaningful insights on the developments in the market, the report has made using different research methods. The market has been segmented on the basis of test type, end user, application, and region. All the key segments are further divided into sub-segments and regions are segmented based on the country. The data on the segments is provided in terms of basis point share. The forecast is also provided in terms of revenue, CAGR, and year-on-year growth. The next section of the report in the global pyrogen testing market provides the market outlook for 2017-2024. The report also offers information on the impact of drivers and challenges in key regions. Geographically, the market is segmented into Asia Pacific (APAC), Europe, North America, the Middle East & Africa (MEA), and Latin America. The report also includes a section providing details on all the leading companies in the market. The key companies are evaluated on various parameters including business overview, product portfolio, latest developments, financial overview, and trends. Insights on the vendors, along with the information on the long-term and short-term strategies by them in the global market for pyrogen testing is also provided in the report. To report offers detail on the market size along with the expected revenue to be generated by during 2017-2024. To offer the perfect forecast, the report includes market size, which forms the basis on how the market is likely to perform in the coming years. Outcome based on the demand side, supply side, and micro and macro-economic factors are also provided in the report. The report also provides data in form of CAGR, revenue, year-on-year growth, this helps in understanding the current and future scenario in the market and to identify growth opportunities in the global pyrogen testing market. The level of information is important for identifying various key trends in the market. Hence, the report provides Porter’s five force analysis, market attractiveness analysis, and SWOT analysis. Another important part of the report is to analyze all the key segments in terms of absolute dollar opportunity. Incremental opportunity is crucial to assess the level of opportunity and also to identify resources in terms of sales in the global market for pyrogen testing. The report also includes market attractiveness index, that is provided with the help of market attractiveness analysis. This helps in identifying growth opportunities in the market for manufacturers. The report also provides information on the current market players as well as new entrants in the market. Pyrogen contamination is mostly found in medical devices and drugs. In order to avoid this contamination, pyrogen testing is being conducted by medical device manufacturers and pharmaceutical companies. With the rising prevalence of various diseases, demand for pharmaceutical drugs is also increasing. Hence, to ensure the safety of patients consuming drugs, pyrogen test is conducted by pharmaceutical companies. In many countries, the government has also made it mandatory to conduct pyrogen testing for safety of patients. Major pharmaceutical companies are also investing in the research and development activities to introduce new medicines for countries with a large population such as China, India, Japan, and other countries. Owing to the large population, the number of diseases are also increasing, hence, the demand for new drugs is increasing. This is leading to the growth of the global pyrogen testing market. The market in developing countries are expected to bring major opportunities for pyrogen testing market. Moreover, development of advanced medical devices including pacemaker, catheters are likely to fuel the demand for pyrogen testing. According to Persistence Market Research (PMR), the global pyrogen testing market is anticipated to see a strong growth during 2017-2024. The global market for pyrogen testing is also estimated to reach US$ 1,372.1 Million in terms of revenue by 2024 end. Among various pyrogen tests, Limulus Amoebocyte Lysate (LAL) test is likely to witness significant growth in the coming years. The LAL test is primarily used for testing medical devices and pharmaceutical drugs. The U.S. Food and Drugs Administration (FDA) has also published guidelines for validation of LAL test. The demand for LAL test kit is also high due to the ease of handling and providing accurate results. LAL test is also highly recommended for detecting bacteria in the raw material used for the production of medicine and also the final product. Moreover, due to the strict regulations imposed by FDA on medical devices and drug approval, increasing number of companies are adopting LAL test to offer safe medication for patients. Major pharmaceutical companies are outsourcing drug development and manufacturing in the Asia Pacific region due to the cost benefit, this is anticipated to drive demand for pyrogen testing in Asia Pacific. Medical device manufacturers are also conducting clinical trials to ensure the safety of patients, this is also likely to positively impact the global market for pyrogen testing. Regulatory bodies across various countries are also encouraging companies to adopt various pyrogen test instead of animal testing. This is resulting in the companies using LAL test and other types of test for pyrogen testing. Compared to medical device industry and biotechnology industry, the pharmaceutical industry is expected to use pyrogen testing on a large scale. Owing to the introduction of new drugs and medicines, companies need to ensure the safety of drugs, hence, pyrogen testing is being adopted on a large scale. Moreover, government and other regulatory bodies across various countries have also made pyrogen testing mandatory for all the pharmaceutical companies and manufacturers of medical devices.